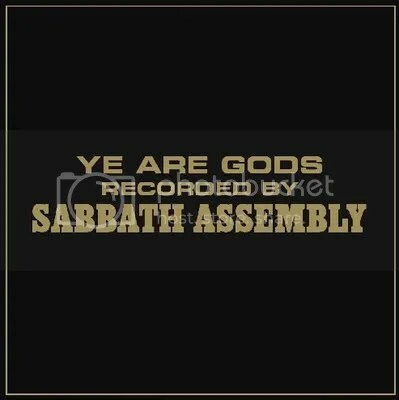 “We are the servants of GOD, no less.” With this phrase starts Sabbath Assembly’s latest creation. As soon as I started listening, a flashback to the years that my mum, as a good catholic, made me go to church; a chant, a priest talking and then a lady with a guitar playing some song. Logic says that because of this connection I’d absolutely hate it, but the music is incredibly pleasant. After the first whole listen what came to me was “a mix of hippie rock with Gregorian chants”, especially has this hippie bong fire round feeling. In terms of lyrics, the songs are based on hymns of The Process Church of the Final Judgment, so if you are no familiarised with this cult, it might be a little confusing. Overlooking that fact, the music is incredibly engaging and exciting. I am most definitively not the flower power/praise out Lord Jesus type, but there is something fascinating about them. Throughout the album, a story about the four main characters (Christ, Jehovah, Lucifer and Satan) is narrated. Form their love/hate relationship to the effects of them in our lives. The story of the apocalypse and the new beginning is told and a terrible character is introduced to us (for the second time, I believe): Abbadon, both villain and sort of unsung hero. The mix of church organs with heavier instruments added up to the constant listening of the names Christ and Satan make his one of the most interesting things your ear will ever have the pleasure to listen to. With interesting messages and beautiful melodies, Sabbath Assembly created a gift to our senses. Hopefully y will give this album a try so you and discover its full beauty.